We are starting a new month that feels so much like Winter but this family we are spotlighting for March has warmed my heart over and over throughout the years! 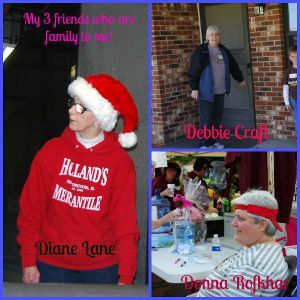 My three long time friends Diane Lane, Donna Rofkhar and Debbie Craft have been there for me during thick and thin for over twenty years. They have helped us at LBFOL during every prep day and event since we began in 2011. They have helped deliver baskets during the year and Diane has helped get items ready throughout the years by marking out bar codes and putting stickers on them. They all three are always eager to help in what ever way they can. So proud to call these three ladies my friends/family! Love and appreciate them so much! If you would like to make a donation in honor of any of them you can do so through our pay pal link or use our mailing address. All donations are tax deductible and very much appreciated. We also delivered our 1091 basket this last week to a family with 6 children who has just moved here and have not been able to find a job yet. We also received a few donations this week. One through pay pal, one from a group of elderly ladies who just want to help bless others who are less fortunate and another from a dear friend who is faithful to give every month. She gives because, in her words, “this is a God thing, not a man thing” She struggles to pay bills but is so faithful to give so others can be blessed! We have had some very cold and strange weather for February and now starting off in March. We have baskets to deliver this next week and continue to get requests weekly from those who are struggling with the “extras” daily. Those who call saying they are having to pay their high utility bills and gas bills and the “extras” not being bought. If you want to help us help others please consider donating! Any amount will help! When those give who have much less than most it should wake us, who have so much and are blessed beyond measure, to think “what if it was me or my family“?